Hi! How was your weekend? 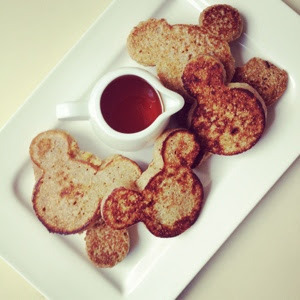 I like trying new recipes on the weekend and on Sunday, I tried a wholemeal pancake recipe. It turned out to be super yummy. 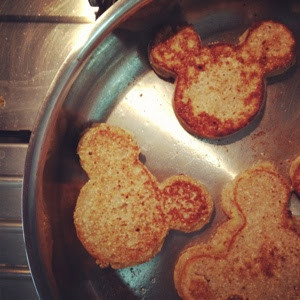 I wasn't sure if the texture would be different so I whipped out these mickey pancake molds and had some fun. The pancakes were slightly different in texture but I really enjoyed them. It kinda reminded me of tapioca cakes. 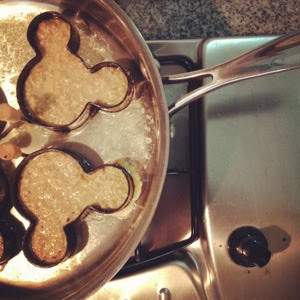 The kids also enjoyed them and didn't mention that they were different but they could have been distracted by the mickey shapes. Here is the recipe if you would like to try it. I doubled the recipe and made extra so I could freeze it for the week ahead. 1. Put the flour, baking powder, salt and caster sugar into a large bowl. In a separate bowl or jug, lightly whisk together the milk and egg, then whisk in the melted butter. Pour the milk mixture into the flour mixture and, using a fork, beat until you have a smooth batter. Any lumps will soon disappear with a little mixing. Let the batter stand for 5 minutes. 2. Heat a non-stick frying pan over a medium heat and add a knob of butter. When it's melted, add a ladle of batter (or two if your frying pan is big enough to cook two pancakes at the same time). It will seem very thick but this is how it should be. Wait until the top of the pancake begins to bubble, then turn it over and cook until both sides are golden brown and the pancake has risen to about 1cm (½in) thick. 3. Repeat until all the batter is used up. You can keep the pancakes warm in a low oven, but they taste best fresh out the pan. 4. Drizzle with generous amount of maple syrup.